The name of our company is Everywhere Chair and yes we specialize in chairs, specifically chairs you can take with you to any event or place you would like. But I bet you didn’t know chairs are not the only thing we sell. I thought since Christmas is right around the corner now would be a good time to start looking at all the unique gifts we have. Of course one of our chairs is always a great gift but let’s look at some of the other things we have. If you are on our website you can look at the category Picnic and Entertaining to find most of these items. We have everything from Picnic Baskets to Wine Accessories, and even Outdoor Grills. One of my favorites is the Piccadilly Picnic Basket by Picnic time. This looks like a traditional picnic basket and comes with everything you need to have a picnic for 2. The only thing you need to add is the food. It even comes with a couple of wine glasses. Just be careful if you wander into the great outdoors with this accessory because big bad wolfs and know-it-all bears like to check out what we carry inside our picnic baskets. If you have a wine lover in your life, as most of us do, then you may want to take a look at the Bouchon Wine Rack and Cork Caddy. 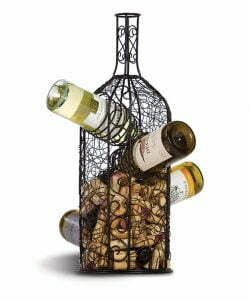 This mini rack, which is shaped like a wine bottle, is designed to hold 4 bottles of wine. The rest of the space is used as cork collector. It’s a functional and stylish way to show off all the bottles you have opened. Lastly is the gift for someone who likes to travel or tailgate. The Caliente Portable Grill and Tote. The grill is 10” in diameter and comes with a tote that makes it easy to transport. But the tote has a little secret, it’s also a cooler. So while you are cooking up some tasty burgers you can put your drinks, extra food, or condiments in the cooler. Makes it much easier to enjoy the meal when everything you need is within reach, and your mayonnaise stays cool. Well there you have it folks. That’s just 3 of the many items we have on our website. So swing by EverywhereChair.com today and look at all the interesting accessories we have. Enjoy shopping!! Comments Off on More than Chairs!